Inspection deal: E.on has contracted CWind to undertake annual inspection and repair services at Humber Gateway. 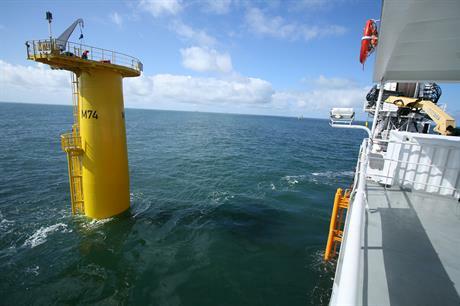 Cabling contract: Developer Vattenfall has contracted VBMS to install the 33kV inter-array cables at Horns Rev 3. The work is due to be carried out in mid-2018 and includes supply, installation, a cable protection system, post-lay burial, termination and testing. Jackets order: Seaway Heavy Lifting has awarded Bladt Industries an order for 30 four-legged jacket foundations for the Beatrice offshore wind farm. Fabrication will take place at Bladt Industries' production facilities at Lindo Industrial Park, Denmark, from Q3 2016. Investment decision: Dong Energy has announced its decision to build the 450MW Borkum Riffgrund 2 wind farm, even though the project is still awaiting final permitting. Borkum Riffgrund 2 was granted a construction permit in December 2011. But the consent needs to be amended to allow for deployment of the larger MHI Vestas V164 8MW turbines it now plans to use. Dong is currently the sole owner of Borkum Riffgrund 2, but "in accordance with our partnership model, we intend to divest up to 50% of the project at a later stage" the company said.